Above: the mill lade started from this small stone and concrete sluice that spans the River Goyt a short distance from Derbyshire Bridge. A channel on the right snaked across the hill side, all the way to the mill pond above the giant waterwheel at Goytsclough. 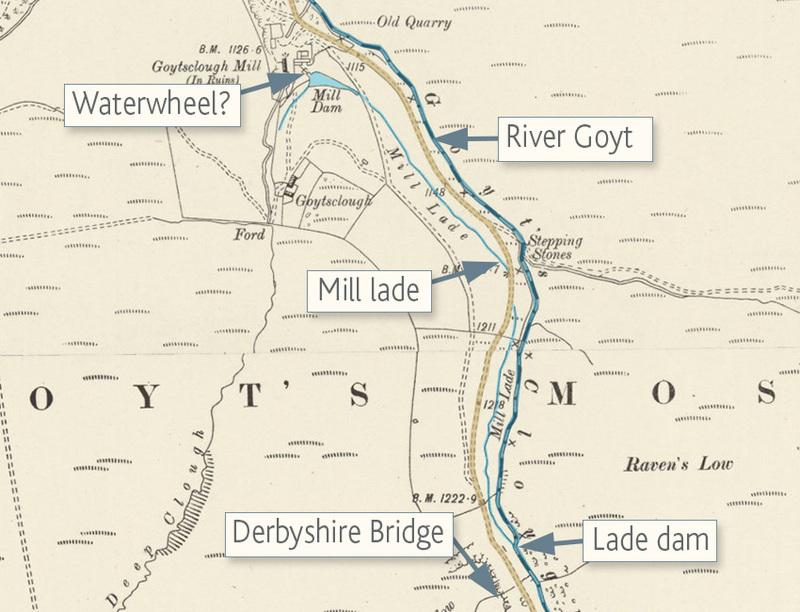 I decided the only way to work out how water was fed from the Goyt to the giant waterwheel at Goytsclough was to walk the lade (water channel) all the way back from the small reservoir to the river. From the top of the reservoir, it looks downhill all the way – which would have defied the force of gravity – so I wondered whether water may have been pumped up to the lade. Above: Looking down from the millpond towards the road it seems like the lade runs down the slope. Late September wasn’t the best time to walk the lade as the hillside was damp and very overgrown. And it proved impossible on the other side of the narrow road between Derbyshire Bridge and Errwood Reservoir. But I persevered as far as I could and it answered my question; despite appearances, it really is a gradual downhill slope all the way from the river to the millpond. I’ve highlighted the lade on an 1890s map (click to enlarge). A small stone and concrete sluice across the river marks the start of the lade (top of page). The water flow would have been controlled by opening and closing a narrow channel on the side of the sluice. From here the lade tracks along the hillside until it passes under the single-track road. And then onto the small reservoir which once stored water to power the waterwheel. 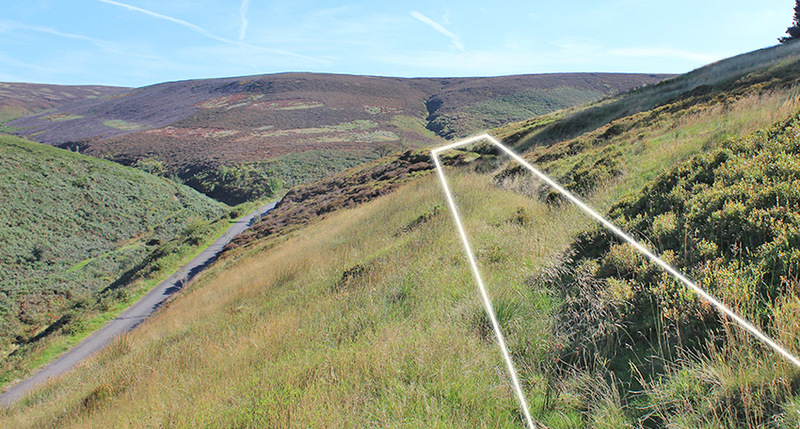 The water is obtained from the Goyt and its tributary to which allusion has been made, and is conveyed along each side of the hill to a small reservoir, from which it is carried by a wooden trunk to the head of the wheel – a cheap and constant motive power. I’m still not sure how water was used from the other side of the hill. There are two streams on this side of the watermill – Deep Clough and Stake Clough – and there’s a small sluice just a short distance upstream which would have controlled the water flow. But both streams run at a far lower level, so couldn’t have fed the waterwheel. So there are still more questions than answers. But that’s not a bad thing as it keeps me occupied trying to work things out! Peaky Blinders visits the Goyt! 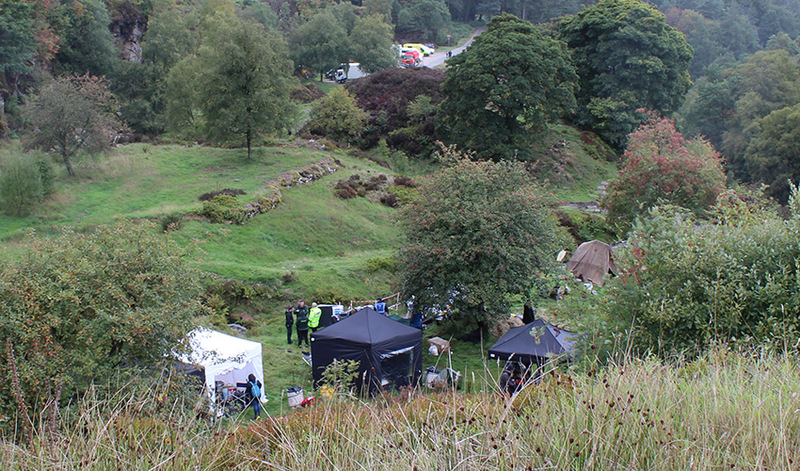 A large film crew were in Goytsclough on the day I tried to walk the lade. Walkers were kept well away from the action but I spotted what looked like a camp of gypsy caravans. It seems they were filming episode three in the fifth series of Peaky Blinders, which is one of my all-time favourite TV shows, featuring a family of ruthless Birmingham gangsters shortly after the end of WW1.